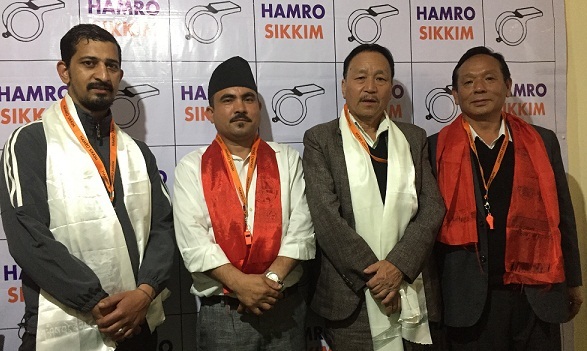 The Hamro Sikkim Party (HSP) has released its second list of four candidates for the upcoming Assembly elections in the State. The party announced the names of BB Dungmali for Poklok-Kamrang, Nima Lepcha of Martam Rumtek, Palman Kami for Salghari-Zoom and Neeraj Adhikari from Khamdong-Singtam during a press conference on Sunday. On the occasion, HSP also released its mini manifesto on its programme on development. Addressing media persons here on Sunday, HSP spokesperson Biraj Adhikari informed that the selected candidates, who are all active in public life and service of people, include a pastor, BB Dungmali, social workers Nima Lepcha and Palman Kami and a research scholar Neeraj Adhikari. Speaking to reporters, BB Dungmali stated HSP is very popular among the people due clean image of Bina Basnett and Bhaichung Bhutia and other leaders of the party. “We have been going ahead with door-to-door campaigning for the last three months and the people have been giving us encouraging response,” he said. Nima Lepcha, who is the founder of a popular organisation, Nepali Bhutia Lepcha Sadhbhawna Sangathan, stressed upon the need of the protection of all communities of Sikkim to save Sikkim. He lashed out at the ruling party for not working for the protection of the people on ground level but just limited to speeches. He stated that the HSP, which is led by youths, would work to lead Sikkimese youths on the right and productive path. Palman Kami and Neeraj Adhikari also assured of giving their best to the party and work to raise voice of the people. The party candidates said they will soon start their door-to-door campaigning in their respective areas by taking the programmes and policies of the party. HSP working president Bhaichung Bhutia mentioned that the party was releasing its election manifesto in different categories. He stated that HSP having the programmes and policies to make a ‘Happy Sikkim’ in next five years. “We have programmes for youths to make them self-reliant and free from politics of flags and slogans. We want to make Sikkimese youths to live their life with full prestige and dignity,” he said. Bhutia stated that HSP can only make Sikkim new, clean and happy. He added the party will work to make Sikkim corruption-free and address issues of unemployment and addiction. The legendary footballer also alleged that SDF party has been doing politics of flags and jollity. He further said to make Sikkim free from politics of party flags, HSP is not asking the people to put party flags on their houses. “We are not putting the party flags in any house in the State,” he said adding, “We are removing our party flags and we will remove all flags of SDF and SKM party before April 11 ,” he said.